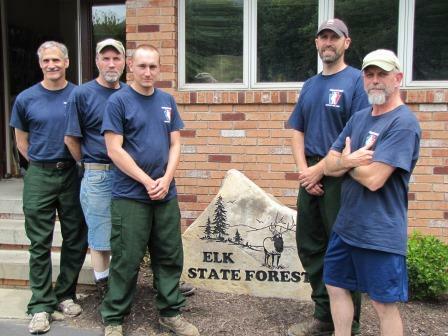 EMPORIUM – Area firefighters are across the country to assist with wildfires, according to Jeanne M. Wambaugh, district forester with the Elk State Forest. Five men were in North Pole, AK on the Stewart Creek 2 fire. These men left July 5 from the Harrisburg International Airport with a larger group of firefighters from the state and have since returned, said Wambaugh. The area men, she said, were Clark Barber and Wade Kisler, both of Port Allegheny; Toby Herzing and Joe Newell, both of St. Mary’s; and Bill Maiers of Johnsonburg. Additional staff members have left for Idaho due to the extremely dry weather there. More are prepared to depart if necessary, said Wambaugh. For more information on the fires, visit www.inciweb.org.